Most biblical translations contain a footnote indicating that the verses were not written by the author of Mark. If God carefully preserved the golden plates on which the Book of Mormon was written, it seems most unlikely that they would contain a forgery that was not in the original Gospel of Mark. More details. "This is perhaps one of the best books on the Book of Mormon I have ever read. Apart from being an absolute must on the shelves of every LDS bookshelf, this collection of well-researched essays provides overwhelming evidence that critics cannot honestly ignore or nit-pick against as they have for years now. A brief analysis and discussion of the geography of 1 Nephi 16 and 17 in the Book of Mormon and the discoveries of plausible locations for Nahom and Bountiful in the Ababian Peninsula that, on its own, disprove that theory that Joseph Smith or anyone else from 1830 authored the Book of Mormon. How the Book of Mormon can plausibly be understood as an ancient Mesoamerican text, with it fitting perfectly into the cultural milieu of that age and locality. I have only scratched the surface with this synopsis. 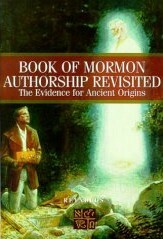 This book is a must-read for anyone, LDS or otherwise, to understand the evidence supporting the divine authenticity of the Book of Mormon volume. D.I. Holmes, "A Multivariate Technique for Authorship Attribution and its Application to the Analysis of Mormon Scripture and Related Texts," Oxford University Press. "Salt Lake City Messenger," Utah Lighthouse Ministry, Issue 84, 1993-April, P. 9-10.